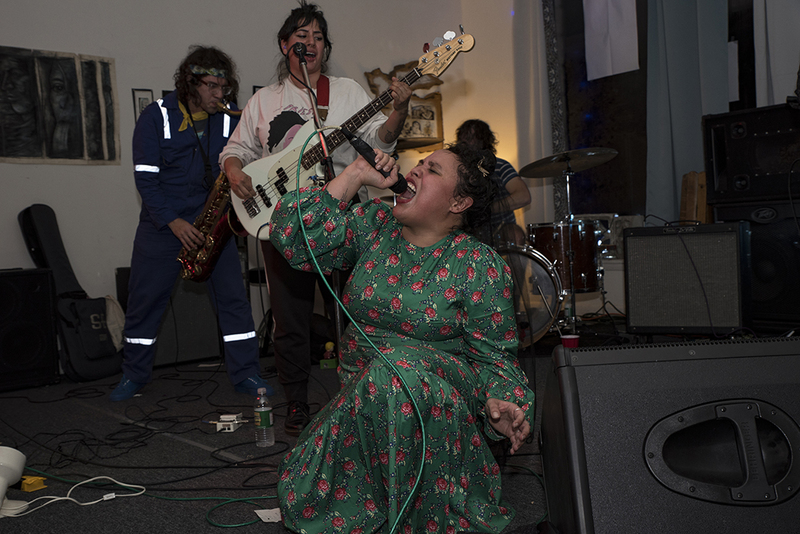 Providence RI, political punks Downtown Boys returned to their DIY roots this week when they kicked off their current tour at DIY record store, Willimantic Records, in Willimantic, CT on Monday 11/26. Tucked away in the back of a nondescript area of stores along the town’s main drag, by railroad tracks that run next to the river, this gem of a place exists. Welcoming people in and fostering musicians, artists, and activists alike, it has been a home to scores of DIY and touring bands of all genres. Long before their signing to Sub Pop and playing large festivals like Coachella or at higher capacity venues all around the country, Downtown Boys found a home and played some of their earliest shows at the store. Though they often play to sizeable crowds now, it was evident how special this small space remains to them throughout their frenetic performance- whether there are 50 people or 500 or 5000 people in the audience, this band fires on all cylinders 100% of the time. Also on the bill were Shrinnirs who played experimental political art punk and whose members are also the proprietors of the shop. Tourmates Algiers gave a powerful politically charged, genre-defying performance that left the air crackling with intensity in their wake. Downtown Boys will conclude their tour in New York on 12/2 after a weekend of shows at Market Hotel and Brooklyn Steel (supporting Mitski) while Algiers will play a benefit for Southern Poverty Law Center on 12/1 at Murmrr Theatre in Brooklyn before embarking on a European tour in January 2019.